This is a ‘mostly’ accurate representation of the area between Bridgwater and Bristol. Due to limitations within ROS platform assignment is not possible, however platforms have been labelled within Temple Meads station for added realism and included within this directory is a more detailed rundown of the included timetable which is based on real workings between 07:00 and 08:00 on 02/01/2019, Schedule_02022019.txt. 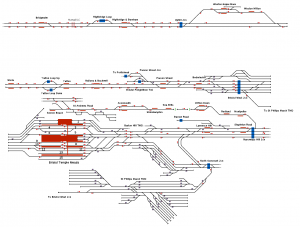 However as trains will stop at the first valid platform they encounter and Temple Meads being formed of several half and half platforms, you may find that getting the train to stop at the timetabled location is not possible. Note the map comes in three sections, be warned the first (Bridgwater-Weston) will likely be hidden when you start (it is above). 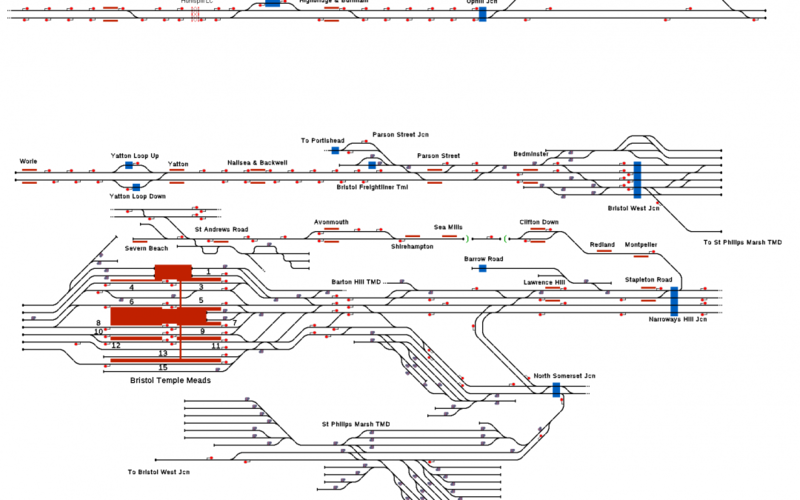 Take note of the connection between Bristol West Junction South (Centre Right) and St Philip’s Marsh TMD (Bottom Left). A session is included with some signals between junctions and crossovers being set to automatic. You can download this project for free here!